The subject of our interest — poison ivy — uses its resin to protect its surfaces from fungal attacks. We humans get caught in the crossfire between the war between plant defense and fungal attack. As the old saying goes, “when the elephants fight, the grass suffers.” In our case however, it seems that when the plants fight, it is the people that suffer. Essentially, the ‘protective armor’ of varnish-like resin has nothing personal against humans, but rather is a defense mechanism that has been developed over 80 million years of inter-organism (plants vs. fungus) struggle. As one academic expert explained, “plant resin is defined operationally as primarily a lipid-soluble mixture of volatile and non-volatile terpenoid and/or phenolic secondary compounds that are (1) usually secreted in specialized structures located either internally or on the surface of the plant and (2) of potential significance in ecological interactions” (Langenheim, 2003, p. 24). 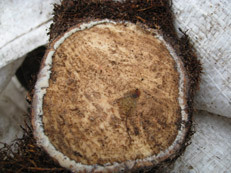 This cross-sectional photograph of a 2 inch diameter cut poison ivy stem gives us a good look at resin (the white ring in this case) that protects the plant surface and causes the skin rash. Note that resin appears to be white in cool spring weather only. In more temperate weather, it would appear to be clear, like vegetable oil. The Resin turned shiny black in all cases once exposed to air. 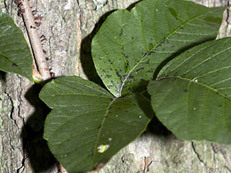 On this leaf the shiny black spots are the plant’s ‘armor’. The leaf has been nicked, and the resin has oozed out in protective response. 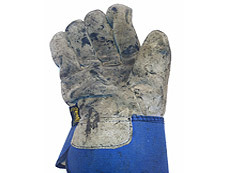 Normal gardening activities that put us in contact with poison ivy expose us to contact with rash causing plant resin (for example, the black spots on these gloves). 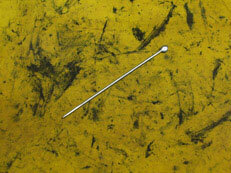 Close up of resin strikes on a yellow vinyl rain suit surface. The amount of resin that fits on the head of this pin is potent enough to cause a skin reaction in fifty resin-hypersensitive people. (Armstrong & Epstein, 1995).